I've seen the little caco enemy a hundred times in my day, so, this cartoon will be a fav of mine already. It'll be great to see what the Chaps do with t. the rest of the costumes, however, are shrouded in mystery! Clever, Chaps, clever. Last edited by Sneakernets on Fri Oct 26, 2007 6:58 am, edited 1 time in total. - Bubs...I dunno, all I can see is that tiny patch of hair. - Strong Mad is wearing a fake head, I'm assuming. Maybe another generic costume - this time Frankenstein? - Can't tell much of Homestar. - He's wearin' a tophat. Charlie Chaplin? - I can't make much of the Poopsmith but his head is flatter. - KOT is also hard to make out. Strong Sad's silhouette (assuming that's Strong Sad) looks like one of those fat kids from The Far Side. It's easier to see if you go into paint and invert the colors. That's what I had to do. Now I can see the fat kid Far Side thing. The hair kinda looks like a tophat but it was like that in the comics too. Also, your wiki page is here! Last edited by BazookaJoe on Thu Oct 25, 2007 9:13 pm, edited 1 time in total. Homesar as Chaplin was also my first thought. Or Groucho" Marx. H*R as Biff Tannen from Back to the Future? P.S. my only two posts are about the Halloween Toon, how funny is that. 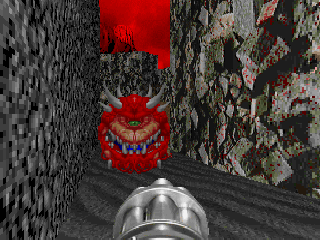 I think Pom-Pom is a dressed up as Cacodemon from Doom. I just wanna see what the chaps will do with it, honestly. Cacodemons float- and so can pom-pom. Last edited by Chekt on Fri Oct 26, 2007 1:51 am, edited 1 time in total. Location: Falling off a cliff. Please send help. One thing that stuck out to me: check out Homsar's legs. No feet, just a solid mass all the way down. He also has some kind of big collar. As for the Poopsmith, I'm thinking maybe some kind of judge. He looks to have some kind of robe, and his head looks like a judge-type powdered wig. I really doubt Marzi is Velma. The hairs all wrong, plus it looks like she has some kind of veil or something. And there's no way the Cheat is Oscar with not trash can. My brother just pointed something out. Bubs looks like he's wearing headphones. Sorry, I belive your guesses need a REALLY better name. KOT: Yeah, he's defiantly salt. 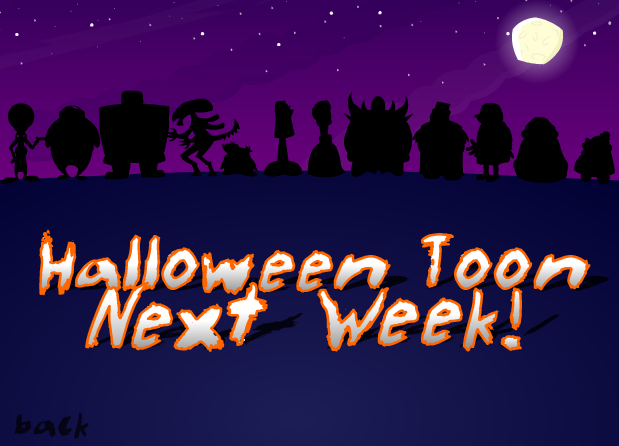 Alien:If you think back to a couple hallowean toons, It could be The Goblin, Or Strong Bad. Coach Z:Most likely a raper. Looks like Pcy P.
"Pucker up Diceman, I'm as upholstered as I wanna be!" looks like he has a toaster on his head, but no guess. Looks like he has a square hat on, maybe a fez? rock star, I don't think those are spikes. salt shaker is a good guess. clown, you can see the double ring around his neck. Last edited by Awexome on Fri Oct 26, 2007 4:38 am, edited 6 times in total. Do goats have antlers? No. Homsar looks a little small here. Or has he always been that small compared to everyone else and I just never noticed? How about the poopsmith = judge dredd? Besides the obvious ones, I agree with Oliver Hardy for Strong Sad and Frankenstein for Strong Mad. No, Strong bad will probably pop up in the end. 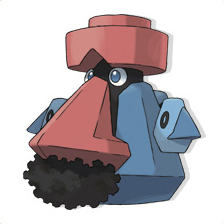 Now that Chris Bad mentions it, Strong Mad DOES kinda look like Thowmp. King of Town looks like a salt shaker, indeed. And how did Strong Bad (if that is Strong Bad) get inside that costume? Bah, you're both wrong and you know it! ...No? First thing that came to my mind when seeing the salt shaker argument. Definitely a rapper, maybe Peacey P, but I don't know if TBC would dress someone up as someone from their own universe. He's either wearing earmuffs or headphones, (you can tell by zooming in on MS Paint.) but that really doesn't give me much. Already confirmed to be Xenomorph, if that is SB. Tough call. He's not wearing antlers, (they're really tiny, I could only see them zoomed in on paint. I'm guessing tufts of hair.) I'm sure of that. Not much you can tell from that, but Charlie Chaplin would be a good guess. I can't tell much, but Velma's my best guess. DEFINITELY a Cacodemon. How can you refute that? Looks like he's wearing a cape when zoomed in on paint, but the only thing that proves is that he is not a far side fat kid. I don't think he's Judge Dredd, since i think he's already done that before. Salt shaker. That's just so KOT that it can't be wrong. I can't make heads or tails of that. A clown, maybe? 3. They're both round, so it would probably make it a cacodemon. little spikes on his head, so I'm guessing he is either Frankinstein or Bart Simpson. Although his clothes are a little rugged, Frankinstein perhaps? :poop: I don't think he's Judge Dredd, since i think he's already done that before. On the other hand, I've just zoomed closely on his head (this makes it possible) and it's not a holmet but hair. Damn. He looks like some kind of caveman...with socks. Strong Mad's head is hairy as well.. so much for Frankenstein. The Cheat apears to have fake cartoony eyes with cartoony eyebrows. And wears a t-shirt. Could be anything.